Panasonic today introduced the Lumix DMC-LX2, successor to the DMC-LX1, which has received high acclaim worldwide for its unique 16:9 wide CCD, plentiful functions, and smart design. 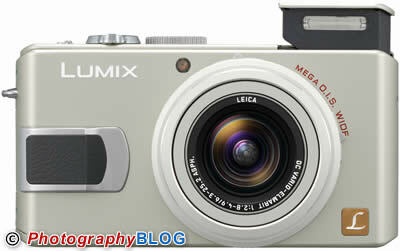 The Panasonic DMC-LX2 inherits the f/2.8 28mm wide angle LEICA DC lens, 4x optical zoom (equivalent to 28mm to 112mm on a 35mm film camera) and MEGA O.I.S. (Optical Image Stabilizer) system in addition to an enhanced CCD capable of 10.2-megapixels and larger 2.8 16:9 wide LCD. The Panasonic DMC-LX2 is unique in that it incorporates triple-wide features of 28 mm wide angle LEICA DC lens, 16:9 wide CCD and 16:9 wide LCD. Not only that, the L X2 is further distinguished from other cameras by its full manual controllability with a joystick allowing users to easily enjoy creative shooting. The DMC-LX2 also boasts Venus Engine III high performance image processing LSI to dramatically reduce the noise that challenged the predecessor, realizing image recording at max. ISO 1600 high sensitivity setting at full resolution. To fight against the major cause of blurred images, Panasonic invented the MEGA O.I.S. system taking advantage of its superior lens technology to compensate for handshake a feature which has long been incorporated into the LUMIX range of cameras. In addition, to also compensate for the other major cause of blurred images movement of the subject the LX2 is also equipped with the worlds first* Intelligent ISO Control (hereafter I.I.C.) within the advanced image processing LSI Venus Engine III. When set to the I.I.C., the Venus Engine III detects the subjects movement and adjusts the ISO setting and shutter speed to best suit the subject movement and the light conditionautomatically. Panasonics excellent image stabilizing system allows users to take clear, crisp images in any situation automatically, leaving everything to the camera. The LUMIX LX series are distinct from other compact cameras in the way they feature extensive manual controls including manual focus and manual exposure which can be smoothly operated with a joystick. This joystick further provides operation shortcuts to the frequently used settings including white balance, ISO, image size, compression format, light metering and AF mode by simply pressing and holding it. It also allows exposure compensation and selection of one out of nine focusing areas. The aspect ratio is easily selectable between 16:9 wide, 3:2 and conventional 4:3 with a switch located on top of the lens barrel to shoot in the framing aspect that best suits the subjects composition or images purpose of use. In addition, the DMC-LX2 is capable of recording wide 16:9 high definition (1280 x 720) motion image at 15 fps. The other features that elevate the DMC-LX2 is the incorporation of 13 MB of built-in memory while the battery life is extended up to 300 pictures* on one charging, not to let you miss those great spur-of-the-moment shots. A print mode has been added to the mode dial so that you can print the images quickly and bundled software allows users to edit and develop RAW files. The unique 16:9 wide CCD and 28mm wide angle LEICA DC lens provide a unique view of the world and which is refined by the Panasonics excellent image stabilizing systems of MEGA O.I.S., the high sensitivity recording and the I.I.C. The LUMIX DMC-LX2 is like no other compact camera, enabling both high-end amateurs and entry-level users to explore the creativeness that surely enhances the joy of shooting. The DMC-LX2 features a 10.2-megapixel 16:9 aspect CCD and f/2.8 4x optical zoom 28mm wide angle* (equivalent to 28 mm to 112 mm on a 35 mm film camera) LEICA DC VARIO-ELMARIT lens. Incorporating three aspherical lenses provides high optical performance while preserving the compactness of the unit. The aspect ratio can be easily selected between 16:9 or 3:2 in addition to the conventional 4:3 with a switch on the lens barrel on a shot-by-shot-basis to best suit the composition of the image. Even after shooting, the 16:9 ratio can be converted to 3:2 or 4:3 with the camera according to your purpose of use. The Extra Optical Zoom, made possible by using the center part of 10.2-megapixel high resolution CCD, further extends the zoom ratio to 5.5x for 5-megapixel image recording in 16:9 aspect with minimal deterioration. * In 16:9 aspect ratio. Taking advantage of its superior lens technology, Panasonic invented the MEGA O.I.S. (Optical Image Stabilizer) to fight against the major cause of blurred images. It compensates for handshake and is now featured on the entire LUMIX range, and having been highly evaluated and appreciated by the users across the world. Every slight hand-shake movement is detected accurately with the sampling frequency at 4,000 times per second and will be compensated to render clear, sharp images. In addition, movement of the subject, the other major cause of blurred images, is suppressed by the advanced image processing LSI Venus Engine III with the Intelligent ISO Control (hereafter I.I.C.) and max.ISO1600 high sensitivity recording capabilities. The worlds first incorporation* of this I.I.C. allows the automatic adjustment of the suitable ISO setting and shutter speed that best suits the situation by analyzing the speed of subject movement. If the subject is moving, the ISO setting would automatically rise to allow high shutter speed. On the other hand, if the subject is still and no movement is detected, you can take beautiful natural images with a low ISO setting. ?Accordingly the new LUMIX automatically takes the best countermeasures against any causes of blurred images with MEGA O.I.S. compensating for hand-shake and the I.I.C. compensating for movement of the subject. Image stabilizing system is further evolving with LUMIX. *For a digital still camera, as of July 19, 2006. The DMC-LX2 adopts the Venus Engine III to realize high sensitivity recording at max. ISO 1600 at full resolution. The noise reduction system is greatly improved by removing noise at the processing stages in series. First, critical noise is roughly undraped and the chromatic noise and the luminance noise are separated to respectively go through the supplemental noise reduction process so that the remaining noise is appropriately minimised. Despite the significantly increased performance of the camera, the Venus Engine III consumes only 80% of the power utilized by the Venus Engine II and is able to achieve a longer battery life of 300 pictures (CIPA) on a single charge. With its multi-task image processing capability, the Venus Engine III also boasts outstanding response time with a shutter release time lag of as short as 0.009 sec*. minimum and the shutter interval of 0.6 sec*. The DMC-LX2 enables easy capture of those spur-of-the-moment shots. The DMC-LX2 also allows unlimited consecutive shooting up to the capacity of the SD/SDHC memory card**. * Not including the time for AF. **The number of recordable pictures depends on the memory card size, battery life, picture size and image compression. The easy-to-use joystick operation and good design, which were part of the highly acclaimed trademarks of the predecessor, are inherited by the DMC-LX2. The joystick was incorporated to facilitate operational ease and thereby get the best technical advantage of the multitude of functions offered by the camera. With the joystick it is possible to set focus and exposure manually, and also quickly shortcut to frequently used variables by just pressing and holding the joystick even while monitoring a subject on the LCD. The predecessor LX1 contained white balance adjustment, ISO setting, image size setting and compression format in its shortcut menu, and the light metering and AF mode settings are now added for the new LX2. It also allows the exposure compensation and selection of one out of nine focusing areas. A switch on the side of the lens barrel lets you quickly change the focus mode between MF, AF or Macro AF. When you focus in the Manual Focus mode, not only the focus distance but also the DOF (depth of field) according to the zoom range and aperture is displayed. An MF assist function enlarges the center of the image to make focusing easier. The focusing area can be enlarged up to 4x and is movable, which also contributes to easy and comfortable manual focusing.? To express the best of the extensive 16:9 wide image recording, a 2.8 wide and large 207 k high resolution LCD is newly equipped. The pixel mixed readout method performed at the CCD achieves high sensitivity to offer sufficient brightness for easy shooting even in low-lit situations. The Power LCD function boosts the brightness level by 40% to secure clear view even in sunny outdoors. The High Angle mode makes the display extremely easy to view from low angles, for example, when holding the camera up high to take pictures over a crowd and can be accessed easily and quickly by using the dedicated button. The DMC-LX2 is capable of recording the 4:3 VGA(640 x 480) and 16:9 wide VGA(848 x 480) motion image recording at 30 fps. Shooting is one thing but viewing is another, and you will be suitably impressed by the 16:9 moving image when it is displayed on a wide screen TV. In addition, the LX2 can record motion images even in high definition (1280 x 720) format at 15 fps. The pixel mixed readout method assists the bright motion image recording even in low lit situation. The AF mode can be selected according to the shooting situation: 9-point, 3-point high speed, 1-point high speed, 1-point normal speed and Spot. In the 1-point and 1-point high speed AF mode, the AF area is selectable from the nine focusing areas with the joystick to best fit the composition of the subjects. Also, the AF assist lamp helps quick, accurate focusing in situations where focusing is difficult due to the lack of light. The AF/AE lock button is also succeeded from the predecessor. An even larger variety of scene modes are contained a total of seventeen* scene modes to assist you in a wide range of photographic situations. The newly incorporated Beach mode is perfect for shooting in strong sunlight and the Aerial mode assists with shooting through the windows of an aeroplane. High Sensitivity** mode is made possible by the pixel-mixed readout method by the CCD, is ideal for shooting moving subjects clearly without blurring at a maximum sensitivity setting of ISO 3200. For additional improvement, the Print mode is also added to the mode dial of the LX2 so that you can make prints by just connecting the camera to Pictbridge -corresponding printers via included USB cable. Of course you can get plural prints of a image or print only those you have selected as your favourite. The DMC-LX2 includes 13MB of built-in memory to serve not just as a tool of shooting images but also as a digital album, to enjoy seeing and showing your favorite pictures. Finally, to edit and develop RAW files, SILKYPIX Developer Studio 2.0SE software application is included with the DMC-LX2. With that, you can freely adjust various setting such as exposure, white balance, and so on afterward with the RAW files to take maximum advantage of digital camera photography enjoyment. **Resolution significantly decreases in high sensitivity mode.